OSWEGO, NY – An archrival football game, outstanding swimming, a never give up golf team and solid running were accompanied by an unbeaten volleyball team to get another week of Oswego High School sports action under way. The rivalry game of the year was played on Friday at the new athletic complex in Fulton as the Red Raiders hosted the Oswego varsity football team. Oswego jumped out to a solid lead as Kyle Lamb ran the ball in from the two yard line for a 6-0 lead with 6:33 left in the first quarter and the extra point was good. With just 35 seconds left in the first quarter Chris Pike threw a touchdown strike to Tyler Lisec for what eventually proved to be a 14-0 advantage after Pike ran the ball in. The Bucs continued to play well, but with seven minutes left in the first half the home team scored for the first time to trail 14-7.Â Fulton got the ball back again and with 3:39 remaining a 67 yard touchdown run knotted the game at 14-14 which was the count at the intermission. Fulton ran it in from 67 yards out with 7:37 left in the third for a 21-14 advantage after three quarters of play. Fulton went on a run with a 35 yard TD run with six minutes left, but the Bucs came back to cut the deficit to seven points with just under three minutes remaining in the third. McRae ran it in from five years out and Dan Ellingwood kicked the point after. However, Fulton scored again on a 37 yard run with 64 seconds remaining for a 35-21 lead with one quarter remaining. Josh McRae scored from 27 yards out for the Bucs with 9:23 to play as the Bucs were once again within a touchdown, but Fulton scored on another huge 67 yard run with 7:30 to go for a 42-28 advantage which ended up being the final score. In the final stats MeRae finished with 20 carries for 109 yards while Lamb carried the ball 22 times for 90 yards.Â Lamb also was on the receiving end of two pass catches for 43 yards. Pike was 4×7 for 90 yards in the air and rushed for 26 yards with eighth carries. The Oswego swim team scored a 94-80 win over Mexico in the latest meet. Mexico jumped out front early, after winning the 200 Medley Relay and then placed first, second and third in the 200 Freestyle. The triple threat of junior Kaila McClelland (2:30.30), senior Haley Annal (2:35.65), and eighth grader Mayra Lopez (2:38.16), took the points back with a 1,2,3 sweep of their own.Â From that point on, Oswego controlled the meet, outscoring Mexico in seven of the next nine events. Senior Mara Parker won both the 50 freestyle (27.14) and the 500 freestyle (5:46.47).Â Freshman stand-outs Colleen Fraser and Carrie Gilbert each won an event a piece.Â Colleen won the 100 breaststroke in a season best time of 1:19.19 and Carrie placed first in the diving event with an impressive score of 175 points. The Oswego Varsity Golf Team participated in another tri-match on Friday, and was successful in defeating the two teams from Central Square and Corcoran on its home turf-shooting a final score of 204 as the crisp fall air settled down around them on Oswego Country Clubâ€™s front nine. Medalist honors for the match went to Oswego sophomore Luke Boshart, who shot a four-over-par round of 39 in wet, breezy conditions. Rose talked about Boshartâ€™s trip to the varsity. There are two ways a golfer could go after an experience like Lukeâ€™s: the golfer could give up on their goals, say It wasnâ€™t meant to be, drown in self pity and quit the game or they could use the experience to vault themselves forward. Luke did the later. Finishing tied for third in qualifying this pre-season, Boshart left no doubt that his game had matured in a year. Now Boshart is competing for the best overall stroke average on the team – a team that not only respects him as a player, but also looks up to him as a leader. â€œFunny what missing a two foot putt can do for your confidence,â€ Rose said. Boshart and the rest of the Buc golfers will finish their season next week with three straight matches on the road (all against division rivals) followed by the sectional tournament-an 18 hole event held at Green Lakes State Park. The teamâ€™s record is now 11-3 overall (6-2) in league play. Oswego junior Mackenzie Robinson, turned in a fine performance for the Lady Buc cross country team, at the 46th Annual McQuaid Invitational, held Saturday in Rochester. In the Varsity AA-2 race championship, competing among a field of 231 runners and 33 schools, Robinson turned in an outstanding time of 19:53 over the rolling 3.0 mile course, to finish a strong 31st in the race. 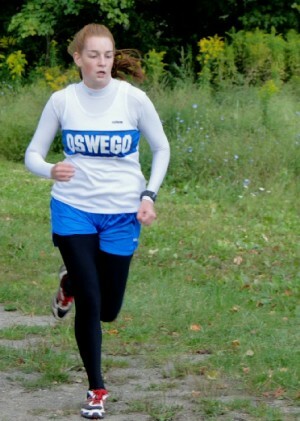 In the Sophomore Championship race, freshmen Meghan LiVoti ran the finest race of her young career, covering the challenging Genesee Valley Park layout in a personal best time of 25:05, to place first for Oswego. Rapidly improving sophomore Kaela Shafer finished second in the race for the Lady Bucs, running a course best time of 25:47, for an improvement of 52 seconds. This year’s McQuaid Invitational, one of the largest in the country, drew a field of over 6000 runners from 6 states and Canada. Running at Genesee Valley Park in Rochester at the McQuaid Invitational this past Saturday, the Oswego High School cross country team ran against some of the best competition on the East Coast. 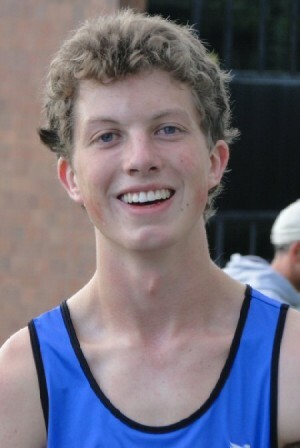 Colin Morgan ran his fastest three mile time ever (16:47) and finished in 32nd place as he received a medal. Mitch Rabalais ran his personal best time of 18:07 which was 59 seconds faster than last year. Jon Mahan dipped under 19 minutes as he was clocked in 18:55. Austin DeMott and Andy DiVita ran well despite the tough competition. Three of the younger Bucs ran in the prestigious Sophomore Race. This was a great opportunity for these three as they typically race against older more experienced athletes. Jimmy Dillon ran the race of his life as he dropped one and a half minutes off his time from last year. His time was 19:26 over the rolling hills course. Jake Annal and Alex Shannon ran very well as they ran to their personal best times for the three mile distance. Oswego defeated the Warriors 25-21, 25-12 and 25-23. Contributing for the Bucs were Mikayla Allen with two kills and an ace, Brooke Broadwell with a dig, Cat Clancy with an ace while Madi Collins had four assists as did Alexa Healy. Molly Malone had two kills and six aces. Cortnie Purce had three kills, four aces and a point block. Sarah Stoebner had two aces and Bella Winkelstine a kill and seven aces. The boys modified soccer team lost to Cicero-North Syracuse 6-0. Oswego played well with CNS only allowing one goal before half time. The start of the third quarter, CNS came out and scored three goals early, catching Oswego off guard.Â Oswegoâ€™s offense was stopped repeatedly by CNSâ€™s defense. Oswego did have scoring opportunities throughout the game, but didnâ€™t capitalize on them. The game was stopped at the end of the third quarter due to continuous physical play by both teams. Players were warned and spoken to by their coaches. The fourth quarter ended with CNS scoring two more goals.Â Throughout the whole game, Oswego players exhibited great hustle every quarter and never gave up. The Bucs also lost to Baldwinsville 5-2. Oswego played a physical game against Baldwinsville. Oswegoâ€™s offense was moving the ball well down the field, passing and holding their positions. Jake Gardner scored Oswegoâ€™s first goal on a penalty kick in the third quarter and Pat Dillon scoring in the fourth. Baldwinsvilleâ€™s passing of the ball allowed for some quick shots on goal, scoring three goals late in the game. Oswegoâ€™s goalieâ€™s Travis Johnson and Pat Dillon did a great job in goal, saving over 10 shots.